Check out this week’s CLP Current Event to learn how ICAN went from a “scrappy coalition of groups from around the world” to Nobel Peace Prize winner. The International Campaign to Abolish Nuclear Weapons (ICAN) successfully moved the United Nations to adopt a treaty banning nuclear weapons. On July 7, 2017, an impressive 122 countries endorsed a treaty to enter a legally binding treaty to end nuclear weapons. 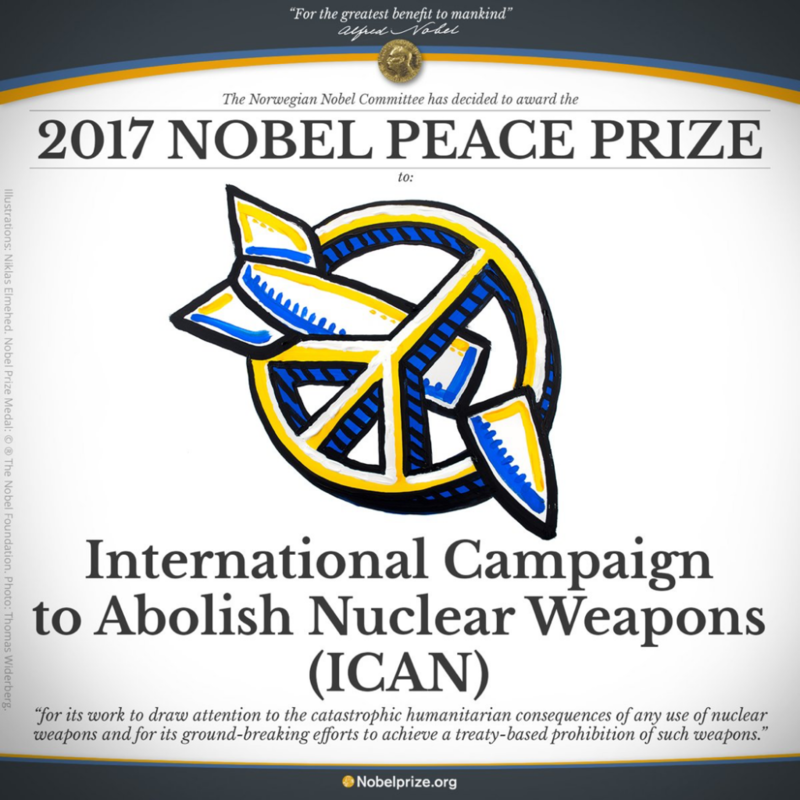 On October 6, 2017, ICAN was awarded the Nobel Prize for Peace. 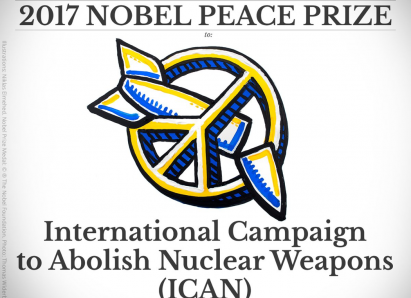 Find out more about ICAN, the Nobel Prize, and the effort to ban nukes here. Adam Smith, Chief Scientific Officer of Nobel Media, interviewing Beatrice Fihn, Executive Director of ICAN, following the announcement of the award. CLP: seeks a new world norm against the use of nuclear weapons. CLP: 122 countries voted yes, but what about the nuclear-weapon-holding countries that did not vote? What is the Nobel peace prize? Who makes the choice of the award winner? How do people and organizations get nominated for the prize? Who are the people who direct ICAN (International Campaign to Abolish Nuclear Weapons)? What experiences and background do they bring to this organization? What is the ratio of women to men? Who is Beatrice Fihn? Does the list of past honorees say something about the meaning of the Nobel prize for peace? Should this prize be aspirational or rewarding specific actions? Does the promotion of peace mean the dismantling of nuclear weapons or a build up of nuclear weapons to discourage others from using them? 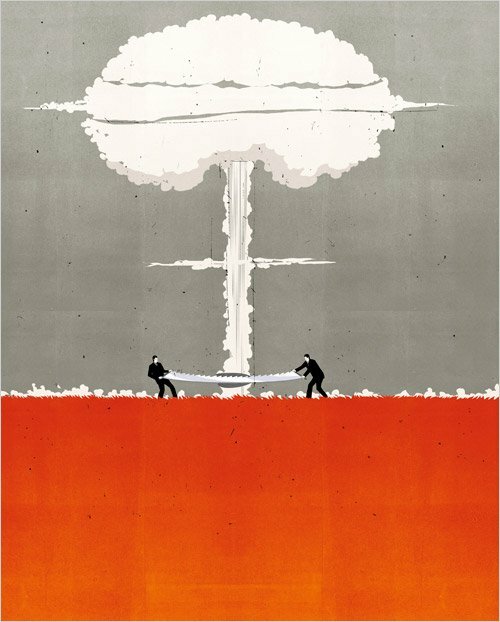 What are the threats of nuclearization? Is a treaty banning nuclear weapons effective if it is not signed by the nations that have nuclear capability? Why or why not? Is there value in encouraging public opinion to reject weaponizing? Might public opinion influence leaders of nation states to think about alternatives to using nuclear weapons? Do current events reflect an urgency to reach a nuclear agreement? What role do concerned individuals and organizations play in encouraging peace? How might North Korea respond to a nuclear ban? How might Iran respond to a nuclear ban? How might the United States respond? In what other areas besides peace does the Nobel organization award prizes? Can you choose anyone for the Nobel Peace Prize? Who selects the Peace Prize Laureate? How do you know if a person or an organization deserves to be awarded a Nobel Peace Prize? Do you always agree? What happens if you do not agree? What do you think the Nobel Peace Prize means today? What do you think it will mean in the future? CLP: survey of the history of the Nobel Peace Prize during its first 100 years. CLP: includes nice graph measuring countries’ preferred solution N. Korea situation. CLP: an Oregon project promoting peace via downloadable lessons including bios, discussion questions, activities. CLP: geared for middle grades, good for younger students or those with reading challenges. HS.59 Demonstrate the skills an dispositions needed to be a critical consumer of information. HS.62 Propose, compare, and judge multiple responses, alternatives, or solutions to issues or problems; then reach an informed, defensible, and supported conclusion.